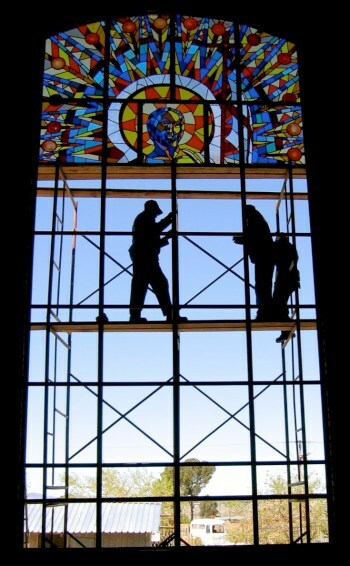 A few years ago, I was commissioned to design a Resurrection window by Fr. Alois from the Jesus Christ Light of the World Catholic Church in Botchebelo, a very poor township outside Bloemfontein in South Africa. The window was to measure 8.3' x 17.2'. I did the full scale design using Glass Eye 2000 Enterprise Edition. At scale, I plotted the design on a 42" HP DesignJet 500 plotter and cut the templates on a Roland CAMM-1 Servo vinyl cutter. I photographed the custom-blown bullion used in the window, and added those images to my Glass Eye 2000 glass library so that I could see them in the design. All correspondence with the Church was done via email including forwarding of designs. 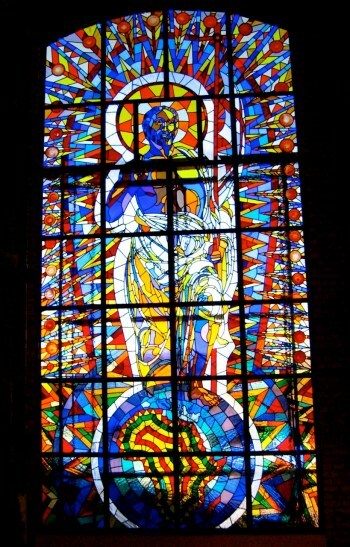 I tried to portray the risen Christ as a African icon, transcending the bounds of the earth, a shining light on Africa. I kept in mind the name of the church: Jesus Christ Light of the World. Christ is holding the crossed staff and flag, victorious over death and bearing the Christian flag for humanity. The figure, radiating with light against a cold blue background and bordered by a red band, is a symbol of the tomb of the Resurrection. The blue, in cold contrast, is a symbol of death stepping into the light. The outer layer of rays with its red round elements is a further design element enhancing the radiation of light. It gives the effect of a cosmic explosion, but also tries to evoke an African feeling by means of repetitive triangular shapes, as in a traditional beaded design. The menacing spears and red circles hint of wounds and suffering. I used a lot of color in the figure of Christ. The blues, purples and browns show that He is an African Christ, and the yellows, oranges and pale ambers give the effect that He is stepping into the light. The design is reminiscent of Latin American Catholic iconography, wrapped in an unmistakable brightness and excitement that could only be interpreted as an African Christ — an icon for the present and the future. I have been using Glass Eye 2000 for the past five years, and because of this software I've been able to throw away my watercolor set, carbon paper and table drawing equipment. 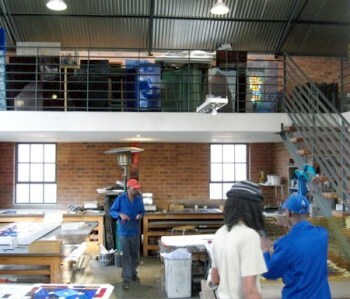 Fanus has been doing stained glass and dalle de verre for the past 20 years. 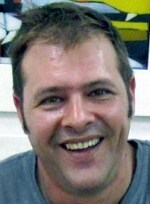 In his early years he shared a studio with his mother Hanna, but in 1999 established his own studio at its present location in Arcadia, Pretoria, South Africa. 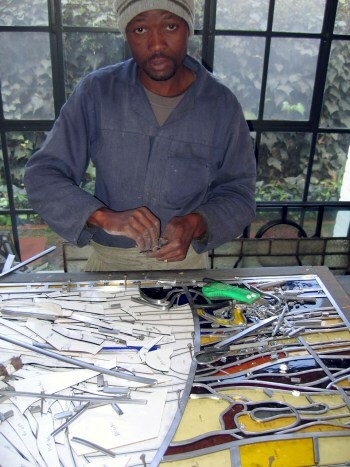 Currently operating with his team of three craftsmen, the studio designs and manufactures a full spectrum of liturgical and private architectural stained glass in southern Africa. He has a website and can be reached by email.